Googling "evaluating teachers" got me 51,400,000 results from such sides as the difficulty and complexity of teacher evaluation, the benefits and challenges of "value-added" logarithms and even who should be doing the evaluating. Like it or not, evaluating is challenging. So how do we go about the process here at Brebeuf Jesuit? We work through a blended approach of formal, one hour, planned observations; one-on-one planning and goal setting meetings; informal walk-throughs; collected materials such as lesson plans, rubrics, sample assessments... and yes, we may even look at the occasional common assessment data. I usually start my conversations with faculty discussing the objective of the process. My objective is not punishment. My objective is not rooting out the weak to bring fire and termination. My objective is professional growth and development. As our mission statement reads, "Students at Brebeuf Jesuit are called to discover and cultivate the fullness of their God-given talents as a responsibility and as an act of workshop." Well guess what? 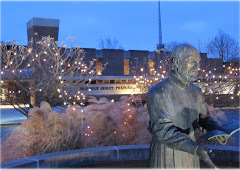 My job as an evaluating administrator is to help teachers of Brebeuf Jesuit to discover and cultivate their God-given talents. I do consider this an act of worship. Definition of "Members of the Principal's Office": Principal, Assistant Principal, Director of Faculty Development. For faculty in their first three years at Brebeuf, the goal-setting and follow-up will occur with the Principal’s Office (and in collaboration with the Department Chair) each year along with the annual evaluation. Faculty beyond three years of experience at Brebeuf will be on a three-year cycle with the evaluation process, so goals would be discussed with the Principal’s Office only every three years. Materials submitted as part of the reflection element are examples of lesson planning (daily lesson and unit plan), sample assessments, samples of student work and a self reflection writing. Most of this is not going to look too radical to most readers. It's a lot of Downey, Marzano, Danielson and a little McTiegh... plus a whole lot of St. Ignatius. What might be different to some is the emphasis on the relationship created. The first step in relationship building is trust. How do I build trust? I'd say it's through listening (really listening), taking time to turn off the phone ringer/minimize computer screen, drop whatever I am doing to focus on the individual. I strive to build conversational around teacher identified areas of growth and strengths. The commitment to not tie monetary compensation to evaluation also builds trust ... as there is nothing like a heavy power imbalance (holding your family's financial success or failure in my subjective little hands) to at seriously hamper a trusting relationship. Finally, relationship requires mutual respect. I work with amazing people. There talents and dedication astound me. I respect them as professional educators and individuals on a journey of growth. I have no idea why they hang with me... but I am thankful they do. If you are interested in learning more about our evaluation system or seeing some of our materials - send an email or note in the comments below. As with our Ed Tech stuff, we share. Be warned - there is no iPad app or automated spreadsheet for this type of work. Only yourself and the desire to cultivate the fullness of individual talents.